From 11-13 December, we will be running a conference in Cape Town on Scaling up HIV/AIDS treatment as prevention: South Africa and Beyond bringing the HIV/AIDS agenda into the spotlight. The UNAIDS report on the global AIDS epidemic 2013 estimates that in 2012, 35.3 million people were living with HIV, with 2.3 million new HIV infections globally. In line with the 6th Millennium Development Goal, cases of new infections are declining, yet HIV remains a global challenge. Building on our two previous conferences on HIV/AIDs, most recently The new era in HIV/AIDS treatment and prevention: science, implementation and finance in 2013, our forthcoming conference in Cape Town celebrates the breakthrough findings of trials investigating the outcomes of the ‘treatment as prevention’ approach to the fight against HIV/AIDS. Early anti-retroviral treatment offers increased probability of a healthy life for HIV sufferers and signifies a potential blockade to HIV transmission across the world. 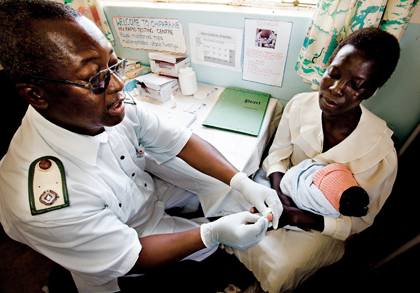 Following on from Africa’s largest conference on AIDS, ICASA, this year’s Wilton Park meeting in South Africa seeks to stimulate dialogue on how to drive this initiative on a global scale – a feat which will require significant resources, as highlighted by our 2011 conference, Financing continued scale-up in HIV treatment (WP1091). Key thinkers are meeting to discuss sustainable implementation in areas of high HIV prevalence, such as Sub-Saharan Africa, at the national, regional and international levels. Drawing on scientific evidence and local experiences, the group will identify potential strategies of finance and implementation to accelerate treatment as prevention. This conference continues our partnership with the Global Health Group, UCSF Global Health Sciences and Gilead. Podcast: HIV/AIDS: what investment in the future?